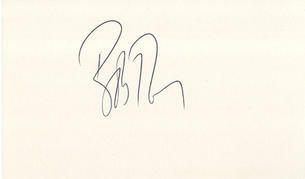 This is an In Person Signed White Card 5" x 3" by the American Professional Golfer. Robert Raymond Tway IV (born May 4, 1959) is an American professional golfer who has won numerous tournaments including eight PGA Tour victories. He spent 25 weeks in the top 10 of the Official World Golf Rankings in 1986-87. Tway was born in Oklahoma City, Oklahoma. He was introduced to golf at the age of five by his father and grandfather. He participated in his first tournament at age seven. He won the Redding Country Club Championship as a junior golfer in Redding, Connecticut. Tway attended Oklahoma State University in Stillwater, Oklahoma, where he had a distinguished career as a member of the golf team - a three-time, first-team All-American his last three years. In 1978, Tway's freshman year, the Cowboys, led by seniors Lindy Miller and David Edwards, won the NCAA Championship. When Oklahoma State won again two years later, Tway was their star player. He was the winner of the Haskins Award in his senior year. He turned pro in 1981 and joined the PGA Tour in 1985. In 1986, he was named PGA Player of the Year and finished the season with four victories including one major, the PGA Championship. He was second on the final money list that year - just a few dollars behind Greg Norman.